If you have lost a single tooth or multiple teeth, dental implants offer an innovative replacement solution. Designed to look, feel, and function like natural teeth, dental implants are a major focus here at Oral & Facial Surgeons of Arizona. Our oral surgeons are certified by the American Board of Oral & Maxillofacial Surgery and have the extensive training and experience necessary to perform dental implant procedures that produce the best possible results. Unlike many general dentistry practices, Oral & Facial Surgeons of Arizona can provide comprehensive dental implant treatment right here under one roof, without the need to refer patients out to other specialists. Advanced dental implants from our practice can improve the function of your teeth and the appearance of your smile with results that can last for decades! The dental implant is genuinely one of the most revolutionary developments the field of reconstructive dentistry has ever seen. Designed to replace missing teeth anywhere in the mouth, dental implants are made of titanium posts that are inserted into the gum and anchored to the jawbone. During a process called osseointegration, the implant should then fuse to the jawbone, mimicking the function of a natural tooth root. A custom dental crown is then affixed to the top of the implant. Ultimately, dental implants should look and feel like natural teeth, lasting many years with the proper care. Dental implants can also be used to enhance support for a partial denture or an All-On-4® fixed hybrid as an alternative to traditional dentures. We use only the best dental implant products at our practice, including implants from Nobel Biocare®, Straumann®, and BioHorizons®. Our dentist will talk with you about the best option for your needs and goals during your initial consultation. 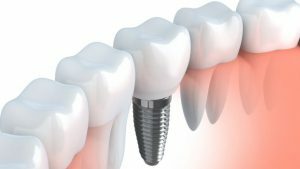 Thanks to advanced technology and state-of-the-art implantation techniques, more individuals are candidates for dental implants today than ever before. It is important for patients to have adequate jawbone density in the area of missing teeth for the implants to be successfully accommodated; however, if you do not have the necessary amount of bone for the implant, there are treatment options available that can often address this concern. Bone grafting can often be performed to provide the implant with enhanced support, and for patients who are missing teeth in the upper jaw, zygomatic implants (described below) may be an option. These treatments have made it possible for many patients who have been previously told they do not qualify as candidates for dental implants to now be eligible for the procedure. Staff made sure I was comfortable. Very good experience! Recommend to anyone who has fears – they will help you through it! For individuals who do not have an adequate amount of bone density in the jaw to accommodate a dental implant, bone grafting can often provide an effective solution. This treatment involves the placement of a small bone graft on the jawbone under the missing tooth. The small bone should fuse to the larger bone, enhancing density and increasing the chance that an implant will successfully remain securely in place. Learn more about bone grafting. Once you are determined to be a good candidate for dental implants, one of our experienced oral surgeons will create a customized treatment plan. Detailed x-rays and computer-generated maps of your oral structures will be developed and used as a precise surgical guide for placement of the dental implants. In many cases, dental implants can be placed utilizing local anesthesia. They will be carefully and meticulously inserted into the gum in the area of the missing teeth, and then securely anchored to the jawbone. Over the next few months, the implants should fuse to the bone and become a permanent fixture in your mouth, much like a natural tooth root. Temporary crowns can be placed on the implants during this period. Once bone fusion has occurred, the permanent dental crowns will be attached to the top of the implant posts. These crowns are completely customized to create results that fit comfortably and function like natural teeth. The crowns will be given a final polish, and then you should be ready to walk out of our office with a brand new smile! One of the major benefits of dental implants is their ability to last long into the future. With proper oral hygiene routines and regular dental check-ups, your dental implants should continue to enhance your smile for decades to come. The cost of dental implants is dependent on each patient’s unique treatment plan. Factors such as the number of implants necessary to achieve your goals, the complexity of the treatment, materials and laboratory fees, whether sedation techniques are utilized, and other associated expenses will be taken into account. Once your treatment plan has been developed at your initial consultation, a member of our team will produce a cost estimate that includes all price factors and go over it with you in detail. We will be happy to talk with you about the range of payment methods we accept here at Oral & Facial Surgeons of Arizona, and we look forward to assisting you in finding the best way to bring the dental implant procedure into your budget. What Are Some Alternatives to Regular Dental Implants? Zygomatic implants offer an innovative option for patients who have severe bone loss in the upper part of the jaw. These advanced implants are longer than traditional dental implants and are anchored to the strong area of bone that’s part of the cheekbone. Zygomatic dental implants do not require a bone grafting treatment and can be placed in a single surgical procedure. Patients who have lost bone density in the upper jaw due to gum disease, tooth loss, or other reasons may have been previously told they are not candidates for dental implants. With zygomatic implants, these patients may now qualify for the procedure. Our practice is very proud to offer these state-of-the-art implants, which can serve as a unique alternative for many patients who suffer from missing teeth. Learn more about zygomatic dental implants. Implant supported fixed hybrid procedures can help patients who are missing multiple teeth add strength and stability to a denture appliance. The innovative All-On-4 technique utilizes four implants strategically placed on an upper or lower dental arch. A full custom denture is then securely affixed to the implants to provide a complete replacement of all missing teeth. All-On-4 can be a very effective option for patients who have lost all teeth on the upper and/or lower areas of their mouth. This “Teeth in a Day” procedure can also eliminate the need for bone grafting and an extended treatment process. With All-On-4, patients can arrive at our office with full rows of missing and leave their appointment with new teeth on the same day! Learn more about All-On-4 fixed hybrid denture alternative. If you would like more information about dental implants, or if you would like to schedule a consultation here at Oral & Facial Surgeons of Arizona, please contact us today.